Rinse the spinach and strawberries. In a bowl, add the spinach. 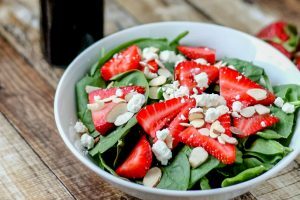 Quarter the strawberries and add those to the spinach. Cut the mint. Add the mint to the bowl. If using, add goat cheese or sunflower seeds. In a jar, add the lemon juice, honey, and olive oil. Shake until creamy. Add dressing to the salad and toss well.